Made in Japan from quality ceramic, this large dinner serving bowl is the perfect accessory to any lunch or dinner party. Serve delicious salads, pastas, dinner rolls, and more in this lovely large serving bowl. With a smooth paper like texture, this large dinner serving bowl is a pale green color similar to Spanish moss. 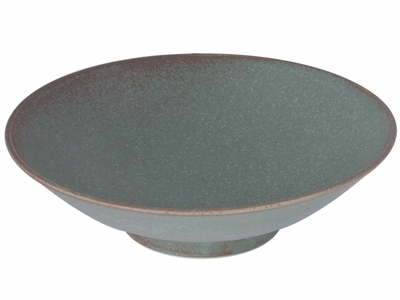 Within the pale green tones are lighter tones of green accompanied by speckles of brown and black all over the Asian bowl. The color then dissolves into an earthy brown color which accentuates the rim of the bowl. While slight and hardly noticeable, the bowl also has soft ridges on the bottom, which makes it easier to carry around. Part of the Moss Green Japanese collection, this large dinner serving bowl is a must have for dinner parties especially around the holidays. Decorate your dining table with the entire collection to really make a statement.